Due to its proximity to the sea and its (relative) proximity to the Far East, Seattle is a bastion of Asian-inflected and maritime cuisines. Far less developed is its reputation for classic French fare. One man however, has been waving the French flag in Washington for decades- Thierry Rautureau, who has has been the chef and proprietor for a handful of such establishments in Seattle for many years. Rautureau is most famous for his tiny and widely acclaimed Rover’s, which shuttered recently after 25 years of service. Rover’s was unique within Seattle, offering white tablecloths, candlelight, and epic multi-course tasting menus of formally presented French classics. His two new restaurants Luc and Loulay, by comparison, are much more relaxed in tone. Luc is very much a bistro while Loulay, located inside the Sheraton building in downtown Seattle, is something in between. 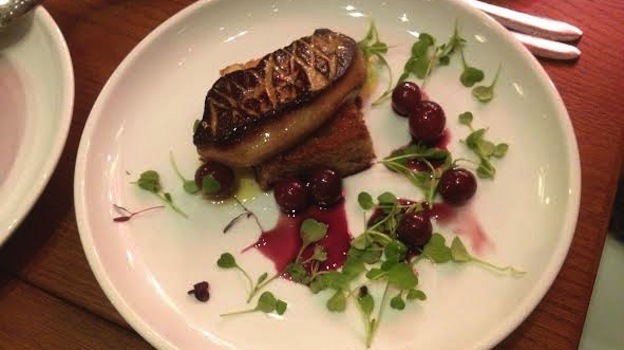 Modern, spacious, and elegantly appointed, Loulay seems to specialize in upscale French country fare. The dishes were hearty yet sophisticated, rarely heavy, and replete with unexpected flourishes. The wine list was impressive; global, but with the expected emphasis on French and American wines. Having absorbed much of Rover’s inventory, Loulay is able to offer far better depth of vintage and value than is typical for a young restaurant. Of special note is their Burgundy section, which offered much from the 1990s and early 2000s, seemingly still at their release prices. Our sommelier, Erica Catubig, was exceptionally well versed in both the list and the menu, and helped us tailor our pairings perfectly. As we were celebrating, we insisted on starting with Champagne, which was perhaps the least developed section of the wine list. 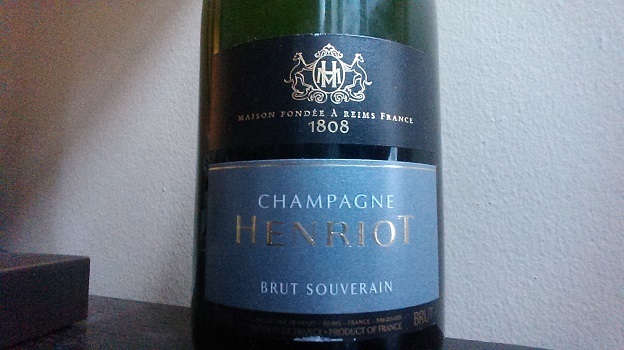 For $100, we purchased a non-vintage Henriot Brut Souverain. Though far from the finest Champagne I’ve ever had, the Henriot was remarkably friendly, charming, and easy to drink. Boasting good richness and a biscuity warmth, a golden apple and roasted lemon fruit profile, and a powerful mineral intensity, the Henriot was an ideal, everyday Champagne. To accompany the Champagne, we ordered a selection of starters, of which the Crab Beignets and the Scallop Tartar were the standouts. The beignets were decadent, crunchy balls of Dungeness crab meat and batter, with a perfectly piquant sauce of harissa aioli underneath. The scallop tartar was, for me, the best dish of the evening. 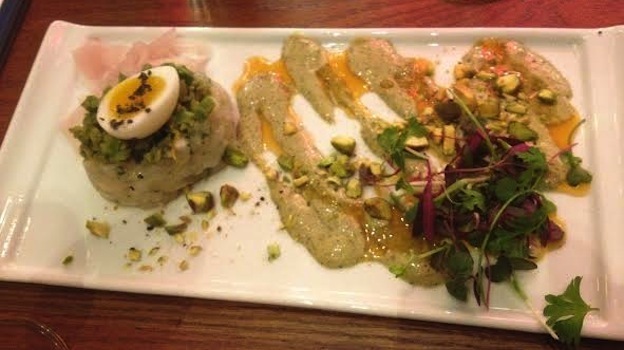 A mound of sweet raw chopped scallops was topped with a cooked quail egg and pistachios; to the side was a lightly briny Castelvetrano olive tapenade, citrus gastrique, and grilled green onion puree, as well as a pile of pickled shallots. Equal parts of all the elements resulted in too busy a bite; we quickly realized the best approach was to focus on the scallop, and add just a touch of everything else, except for the pickled shallots, whose sweet intensity was a bit overwhelming. Both of these dishes were great with the Champagne, though in retrospect a less broad, more citric Champagne would have been the superior match. For the two reds, we brought in a 1979 Hanzell Pinot Noir and a 1964 Inglenook Cabernet Sauvignon. Both were in exceptional condition, and showed remarkable evolutions over the course of the hour+ in which we enjoyed them. When first opened the Hanzell was powerful and savory, with a nose of smoked olives, river mud, and iron. With some air, however, a dark cherry and floral tone began to emerge, and slowly took over the aromatics. On the palate it was big and meaty—fully mature though not at all tired-- with an impressive richness and length. The nose’s iron note was echoed on the palate in the form of a deep sanguine tang that was both metallic and energetic. Overall it was a gorgeous, though muscular, Pinot Noir. 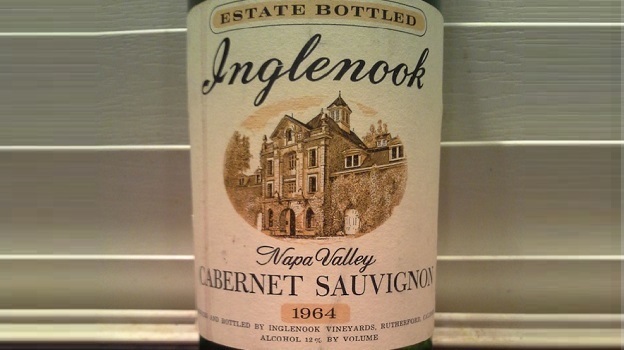 The Inglenook showed more initial sweetness of fruit than the Hanzell did, along with aromas of licorice, leather, sugared blueberries, sweet balsa wood, and oolong. On the palate the wine was deep and intricate, with layers of dusty plum fruit, a smoky mineral quality, and fine, chalky tannins. While certainly present, the acidity was perfectly integrated, so the over all palate impression of the wine was of richness and depth. Still quite powerful, broad-shouldered, and aromatically youthful, the tapering of the finish indicated that this was at its peak, and should be consumed sooner rather than later. Even with that slight flaw, however, the wine remained potent, profound, and highly enjoyable. Gorgeous. To pair with these lovely, mature bottles, Erica helped us select a grouping of entrees, all of which were spectacular. The duck confit sliders, while technically an appetizer, were especially good with the Hanzell. The duck preparation was rich and intense, deliciously hedonistic, and thankfully parceled out into bite-sized portions. The smoked pork cheeks were also inspired. The cheeks were meaty yet tender, perfectly cooked, and simply melted in the mouth. The smoked quality was perfectly subtle, and emphasized the fruit tones in both of the wines. In lieu of dessert we ordered the Foie Gras which, though certainly decadent, was elevated by the bright bursts of the lightly pickled grapes and an impossibly deft port reduction sauce. 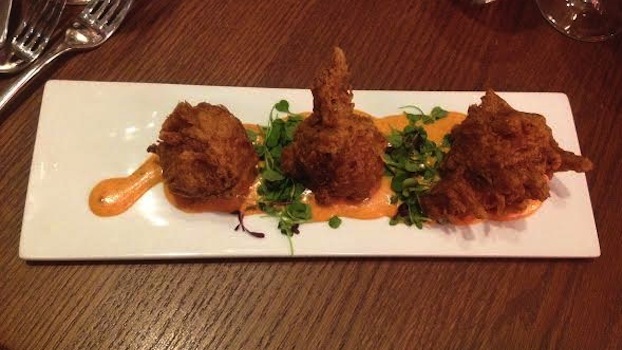 A tantalizing end to a truly stand-out meal. While my first thought upon landing in Seattle is hardly to run to the nearest French restaurant, I'm happy I let my friends guide me to this gem. There is good reason why chef Rautureau has been able to carve out such a lasting legacy. At Loulay, every element-- the food, the wine list, the service, the setting-- was in perfect sync, and each conveyed the same message-- one of casual elegance, attention to detail, and quality without pretension.